The Easy Step II Extra Wide Pet Stair has wide, deep steps to give larger dogs the ability to get their entire body on each platform and comfortably climb the stairs. 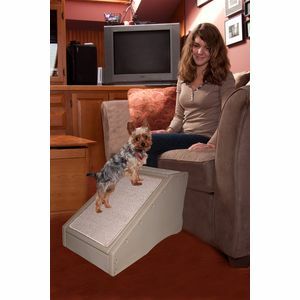 The innovative incline of each step reduces the amount of stairs needed to climb eliminating stress on your pet. The carpet tread removes easily and is machine washable. The stair easily snaps together (no tools required). 22″L x 20″W x 16″H. 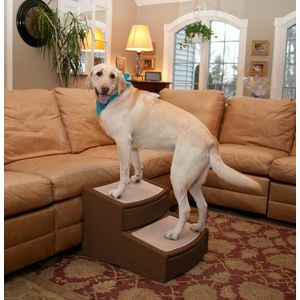 The Easy Step III Extra Wide Pet Stair has wide, deep steps to give larger dogs the ability to get their entire body on each platform and comfortably climb the stairs. 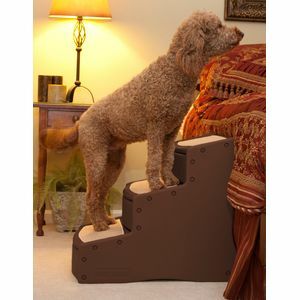 The innovative incline of each step reduces the amount of stairs needed to climb eliminating stress on your pet. The carpet tread removes easily and is machine washable. The stair easily snaps together (no tools required). 25″L x 20″W x 23″H.